Thanks Mick, the 67 class is a nice looking loco, be added to my long loco list, yeah your layout sure has stood up to your bad weather conditions. Good thing is I can keep in tough with the form while in hospital. Yes it's me - I'm still around. It's been a while again but after a good few days contemplating the situation I have now relocated the bay platform point at Sheiling Bridge station that was too close to the cladding. It had been a tight squeeze to access that road even prior to the installation of the cladding but afterwards it became unusable as you can see below. I really didn't fancy having to move the point at all and in fact almost decided just to install a section of plain track and remove the second siding altogether but it always came in handy for storage and my plans include several DMU's so I decided that however unprototypical it might look I would move the point further along the platform. It will of course substantially reduce the length of the bay platforms but I can still work with that. 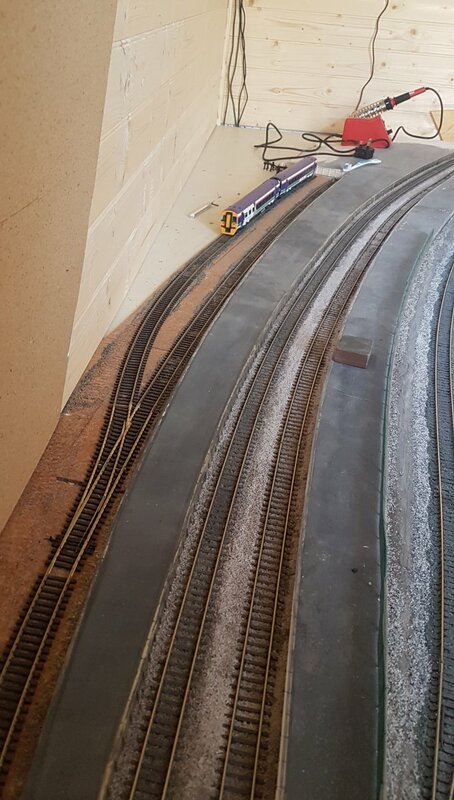 So now with the point relocated I have good clear access along the side of the shed and room for two DMU's. It's far from ideal but unlike 'Thomas' I didn't do sufficient planning beforehand and thus I'm left with this situation. Anyway, it's something that's been holding me back and it's now out of the way so it might encourage me to get something else moving forward. 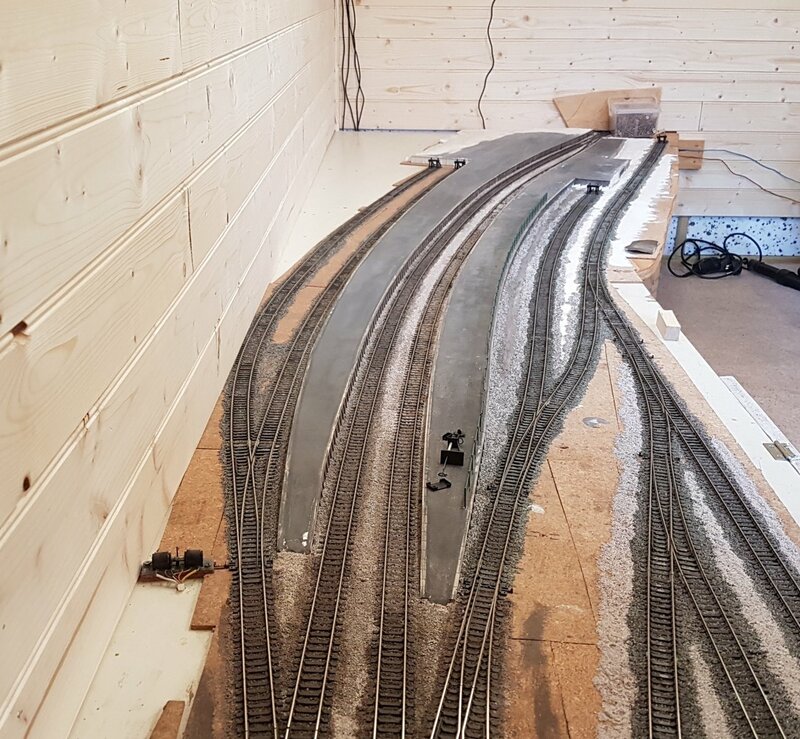 There's a good bit of space to the rear corner of the shed behind where the station buildings will be located which might have been useful for additional storage roads but would have meant leaning over the layout in order to get access to them so I discounted that idea. I'm happy with what there is. I've considered some kind of cassette storage system in order to put rakes on and off track easily should I ever need to but that's for some future time. I'm aware that I have the outdoor line to sort out this year too so can't afford to take on any additional work. The above photo seems to make the bay platform and siding appear shorter than they actually are so I've just taken a photo of a 2-car DMU standing at the buffers on the storage road for comparison. There's sufficient room for a 3-car alongside the platform so that's fine. Here's some photos of a few other DMU's that are now part of the Worsley Dale roster. 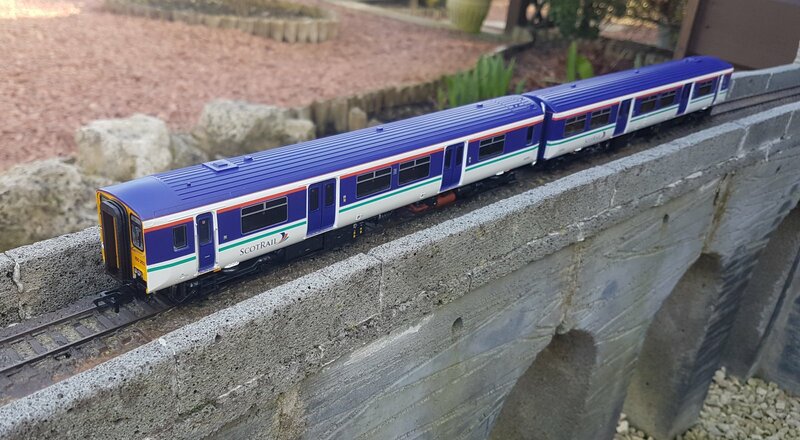 Bachmann class 158 2-car DMU in National Express Scotrail livery. This livery is from the period March 1997 to October 2004. 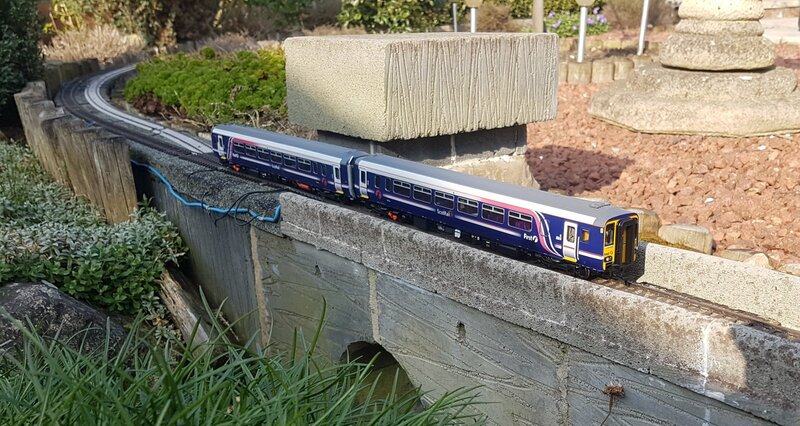 Bachmann class 150 DMU, again in National Express Scotrail livery. This is a Realtrack class 156 DMU in First Scotrail 'Barbie' livery. The 'First Group' franchise existed between October 2004 and March 2015. This model is sound fitted. 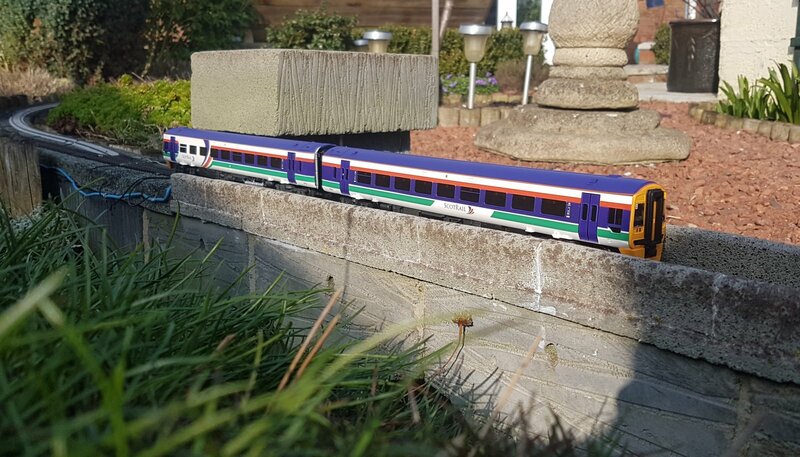 Finally a Bachmann class 170 Turbostar 3-car DMU in First Scotrail livery. Like the Bachmann class 158 pictured above, this model is unfortunately not DCC ready so needs a DCC chip hard wiring in order for it to work on Worsley Dale. Plenty of work for me to be getting on with. I have noticed that this is an issue for me. When I'm procrastinating over a job, or simply not getting on with it, I now take a step back. I ask myself, "what is the one thing I have yet to make my mind up on?" Once I've clearly defined what the issue is, I confront myself with it. I then have a clear choice. Either I decide what I'm going to do and then get on and do it. Or I have to walk away form the job and do something else. Sitting there pondering wastes time and doesn't get it done. I've started referring to the procrastination as "stroking my beard". It's now become a term my friends and I use when we spending more time thinkings about our railways than building them. I'm amazed how often my progress is stopped by one simple thing that I can't make my mind up on. Anyway. Great to see you back at it Mick. Looks like your end of Yorkshire is getting the same weather as mine. Love the Scotrail units. However, I don't need the temptation placed in front of me. It's taking a lot of will power not to buy myself a rake of a push-pull Scotrail Express. Loved that livery when I did a rail rover north of the boarder in August 1987. ... Love the Scotrail units. However, I don't need the temptation placed in front of me. It's taking a lot of will power not to buy myself a rake of a push-pull Scotrail Express. Loved that livery when I did a rail rover north of the boarder in August 1987. 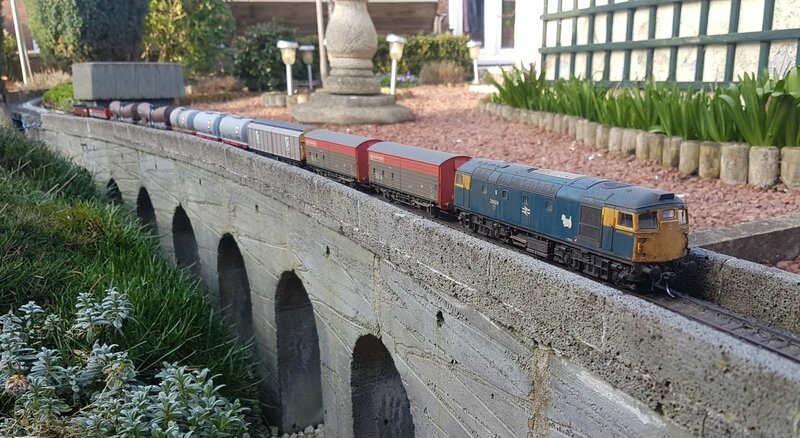 Anyway, back to earth and one of the things I've been looking at is adding some additional freight traffic as other than the log train I have nothing else that really depicts the Scottish scene. I have some suitable wagons already in my collection but not in the liveries I want so here's what I can come up with so far. There's no requirement for a large number of freight wagons but I would like to try include liveries that could have been seen running together at some point. Short mixed freights should be quite easy to put together but although I have a number of other VBA, VGA and OBA wagons they're all in EWS livery. I suppose what I need to do is decide what kind of industries might exist along the line. It doesn't have to adhere to any particular prototype location. If I can see an excuse to run some HEA coal hoppers then I can include a few of those too. I guess that's all part of the fun in that I can include whatever I deem is required. I need to have a think about it and come up with a story. That's a nice set of photos Mick. Have you looked at the PRA wagons that Kernow Model Centre are producing? They are very appropriate for a Scottish freight train, running from Cornwall to Corpach paper mill. Temptation has gotten the better of me too - completely out of my timeframe, I've ordered a set of the Trans Pennine Mk5's, with a view to getting a Dapol 68 in the same livery. Like a lot of people, I really like these locos and in the future, I'm looking forward to using a lot of my free travel, going backwards and forwards over the Pennines! We should organise a Trans-Pennine day out!! Thank for the heads up there Iain. They'll add a bit more variety to my freight rakes, mind you, they're not cheap are they? It's not that long ago we were picking loco's up for those kind of prices. In fact I remember clearly ordering a brand new ViTrains class 37 from one major outlet for less than £40! 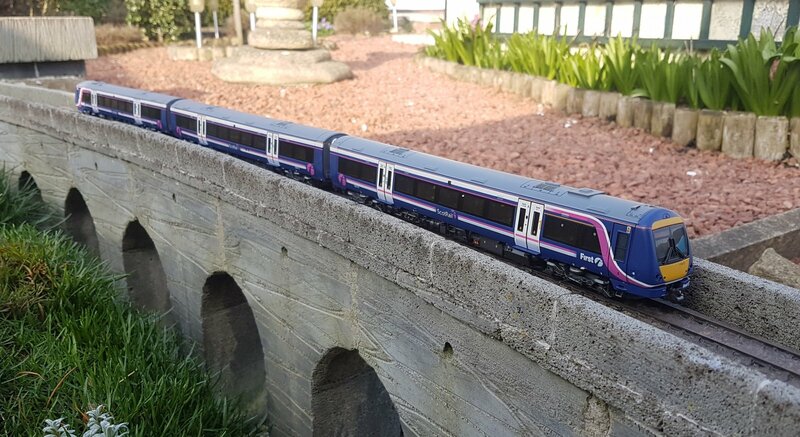 I succumbed to a Dapol 68 in Scotrail livery during a certain retailers 'Sale of the Century' with no idea at all what I was going to run with it! I really do like the Trans Pennine liveried 68s and they'll look superb with the Accurascale MK5 coaches. Surely a rake of the newly announced Accurascale PFA Gypsum wagons won't look out of place running around Worlsey Dale will they? I know Worsley Dale was supposed to depict an Heritage Line/Scottish themed layout but perhaps I can stretch to the Settle & Carlisle too? Even Ribblehead Viaduct is single tracked so they're not going to look entirely out of place going across Stack Gill or Low Shott viaducts? But then if I do, does that give me an excuse to run my MGR and HTA coal trains too? A lot of what I remember most used to run up and down the S&C but unfortunately I don't have the siding space to accommodate such lengthy trains and I wouldn't be content running them at much less than scale length. I think I need a bigger garden railway! 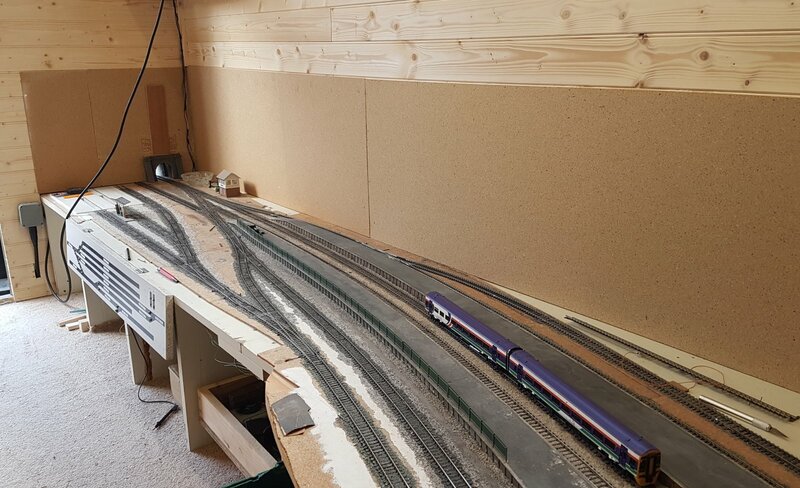 Hi Mick can those Bachmann class 170 Turbostar 3 car DMU sets connect to another set. In model form I'm not sure Tony, I would have to get them out to check. It's not something I'd ever considered but looking at prototype photos they certainly ran in multiple sets on occasion. I'm sure they could be coupled together in one way or another even if there wasn't provision for a standard coupling on the leading cars. Will let you know. That's some seriously colorful DMU action on the lines. Looks beautiful! Nice to see you have some decent weather to run trains in. Also, I think your modeling skills have improved a lot. I recall some old shots of an attic railway you had and the new station's track work ballast and weathering is top notch. The platforms look really nice too. It seems like you are developing some serious skill there. ...Also, I think your modeling skills have improved a lot. I recall some old shots of an attic railway you had and the new station's track work ballast and weathering is top notch. The platforms look really nice too. It seems like you are developing some serious skill there. If only that was the case Griff! I think I belong firmly in the 'Ready to Run' category with very limited modelling skills. If I'd got the tiniest amount of modelling skills then Worsley Dale would be about as complete as it could be by now. I just find it extremely difficult to motivate myself even when it's something I dearly want to do - and the garden railway IS something I really want to complete. The photos I post here only tell part of the story. The indoor station and platforms were built about 2-3 years ago now and if you look at them they've changed very little since then. I just haven't been able to bring myself to finishing them. The outside running line is better because that's the part I enjoy the most and the part I personally enjoy seeing. For some reason I can't seem to get on with the finer details indoors. The attic railway - ditto - much the same as it last was although there are a few metres of track laid and electrically wired. It's not an ideal location up there and generally always feels uncomfortable but I can't justify even more expense in getting it properly insulated on the off chance I might get round to using it some day. It's not that I don't have the time to do things but I often feel I have so many things I can do that nothing ever really gets done properly. 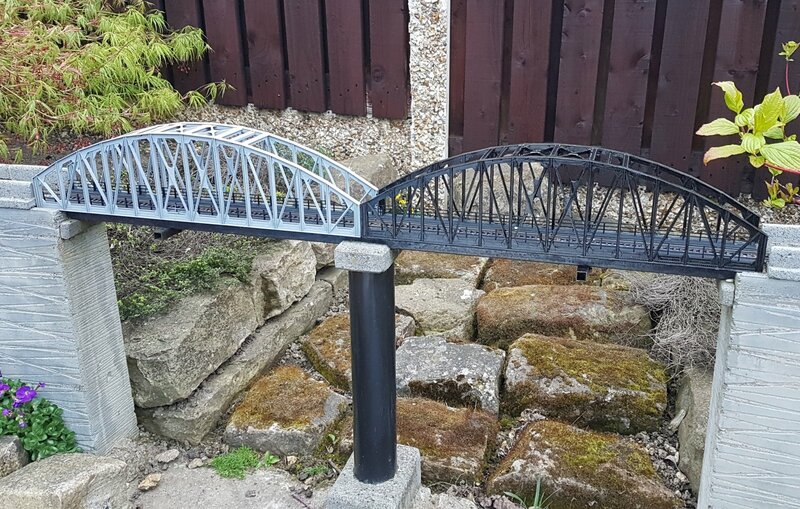 Seeing how other members on the forum, including yourself, are able to progress with their individual projects puts me to shame. Sorry Mick, but I must disagree with you. You do have many interests, just as I do, and that does mean that we flit from one to another and eventually back again, with nothing being achieved or finished in between times. Occasionally, we do get the bug and the weather all together and a sudden burst of proper progress is made. I abandoned my garden railway in favour of a portable tram layout. That is unfinished with not even completed trackwork. I have my Mazda MX5 which I look after. I have two partly dismantled stationary engines from the 1940's, and I have now bought a 26 year old campervan. Let's not forget the camera, and book reading, and metal detecting. Are we really any different? Probably both Gemini too. But we enjoy what we do, despite getting fed up with ourselves sometimes. Finally, don't forget that we are getting older, and that slows us down. It is not important to reach the end product, but it is important to enjoy the building and the progress. That's what you are doing, and it shows in your craftsmanship! Just carry on with what you are doing, buy all those new wagons if you want to. Arrange some sidings in your shed even if you have to split the rake into two to get them in. Tony has the prototype with his Indian Pacific in Sydney. Most of all, enjoy what you are doing. So that's you told! Doesn't alter the fact that I never seem to get anything done Roddy! Yes, it certainly sounds like we've got a number of mutual interests although my van is static and my car is an SLK. Good work with the star sign of which I'm absolutely typical. Do you also breed mealworms? Sorry, that's something else I've got myself into as a way of attracting wildlife as it's cheaper than purchasing them. The wagons are already ordered so better get somewhere ready to run them. For the benefit of the forum I'll put in some extra effort. It's OK Mick, I seldom finish anything either. It's our Gemini split personality. So much to do that we can't even keep up with ourselves. Just enjoy what you are doing. That is the only important thing whatever we spend or time and money doing (or not doing). 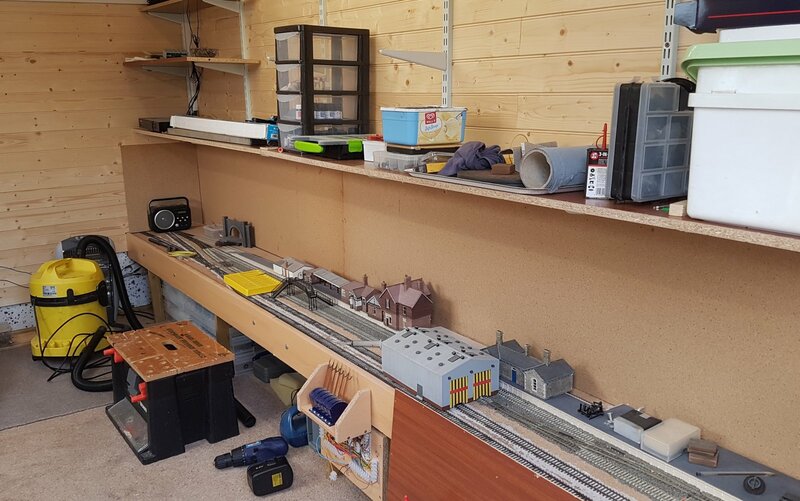 Shamed into doing something I decided to spend an hour in the shed this afternoon and one of the main things that needed doing at this time is the backscene and tunnel entrances. I've had some thin boards stored in the attic and shed for a while now that were kept specifically for the backscene but I always had this feeling that 'something else' needed doing first before I could fix them in place. I'm not even sure what that 'something else' was but it had brought my progress to a halt. 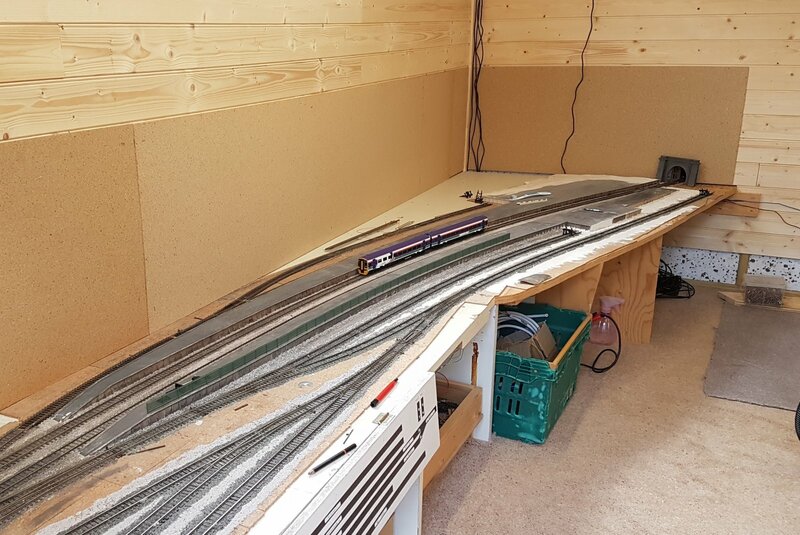 The terminus station had already had the backscene boards fixed in position some time ago so without pondering the situation any further I got out the stapler and fastened them to the rear walls of the main station too. They'll be painted or something and finished in due course. Below is the left hand end which leads out onto Low Shott viaduct. I've had additional work to do here in order to get the tunnel portal to fit correctly and make provision for the shutter to slide up and down in order to close the entrance hole. How I'm going to blend the backscene in I have no idea just yet. 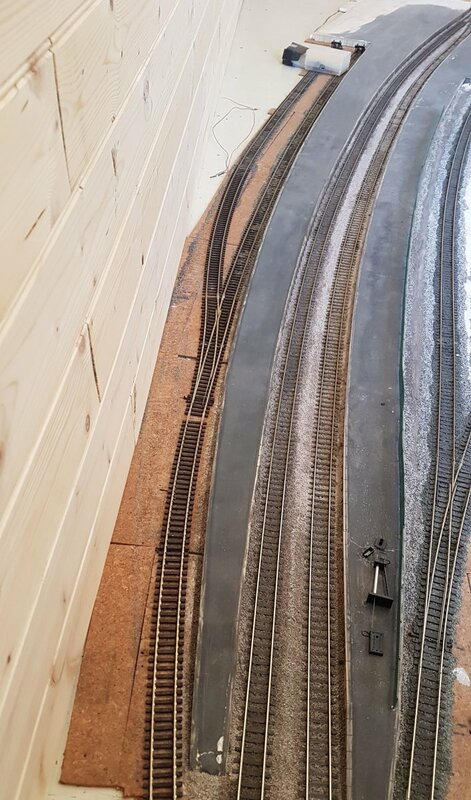 There is very little room on the end wall to do any scenics around the entrance tunnel or behind the loco shed when it is replaced on the concrete apron. The right hand end (below) is similar with the tunnel portal at a slight skew in order to align with the curvature of the track. Still lots of wires and cables to hide away as you can see and there's also the little matter of some tongue and groove boarding to finish at floor level. I'm currently thinking of a raised rocky/wooded area behind the station - I'm not interested in portraying a town scene or anything like that as I don't have the patience. It just needs a backdrop leaving the focus completely on the trains. I feel much better for having done something today even if it's only a meagre effort. Looking at the photos here makes it look not such as big a task as I'd got to thinking and it's certainly an improvement on how it all looked 12 months ago. With all the buildings replaced in their permanent positions it should look okay. While there's a lengthy list of major work that needs doing on Worsley Dale I've spent the afternoon doing things that are less important and in one instance a task that hadn't even been considered up to today. If it's what you feel like doing then it's usually better to go with it. The tunnel entrance to the shed received some extra work filling in the inner walls of the tunnel itself with exterior grade Polyfilla and then the track leading from Low Shott viaduct into the shed was ballasted as it's never been done so before. I used exterior varnish thinned with white spirit as fixative for the granite ballast as it works very well. And then for some strange reason I thought about painting the girder bridges on Stack Gill viaduct. 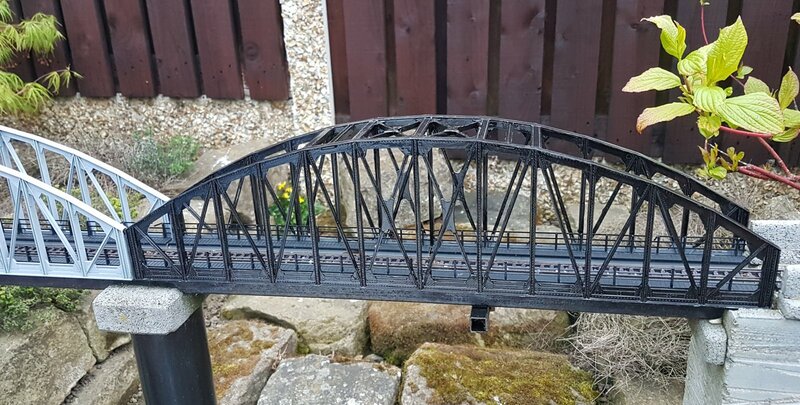 They've been in grey primer since they were first installed and as we'd recently opened a tin of black Hammerite to paint a metal gate I thought about using the remainder on the bridges. What I hadn't considered was just how long that was going to take using a small brush and how difficult it would be accessing all the nooks and crannies. Hours later and one half is almost completed, though there is some touching up required. It looks a lot better with a coat of black. You've remineded me why I spray this kind of structure with an aerosol rather than getting my paint brush out.